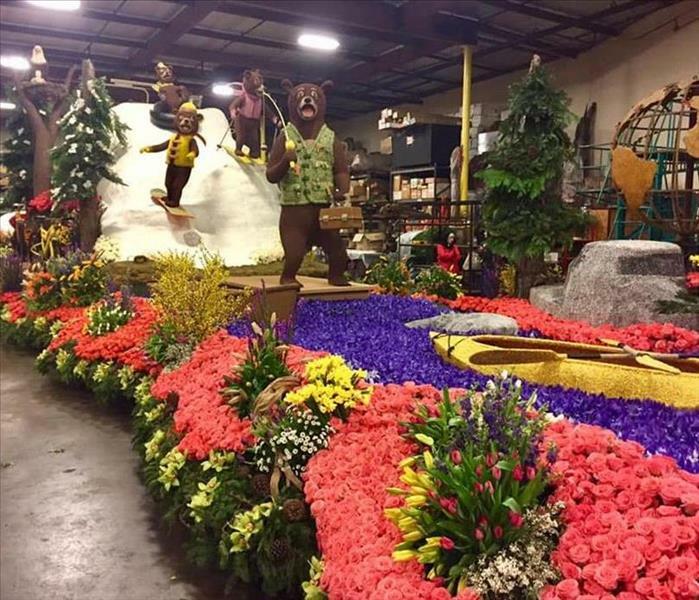 Congratulations Big Bear on your beautiful float in the 2019 Rose Parade. We at SERVPRO Big Bear are really proud of you representing our community with this great float! 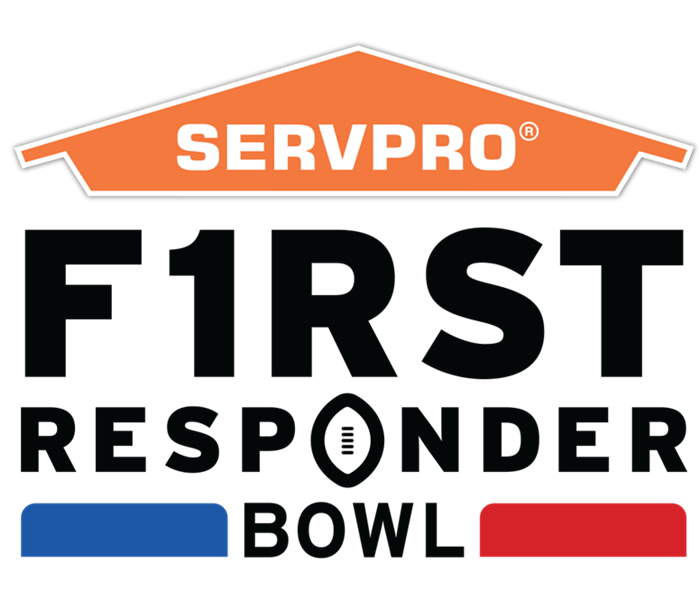 SERVPRO of Big Bear is proud to be part of the First Responders Bowl on December 26, 2018 in Dallas Texas. We are proud of the first responders in our mountain communities and how they work so hard to keep us safe and healthy. How Did The Damage Happen??? 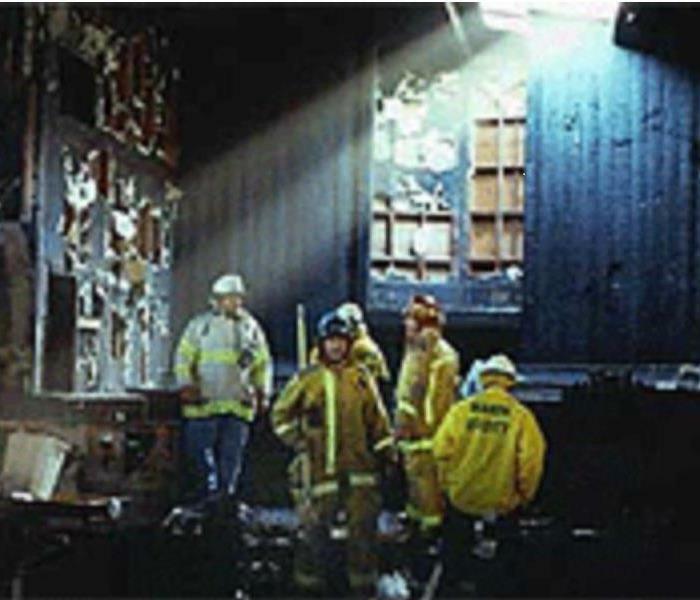 One of the jobs that we have as the crew that remediates a loss is to find and photograph the cause of loss for each job we do. In this case it is pretty obvious. The pipes in the wall burst. 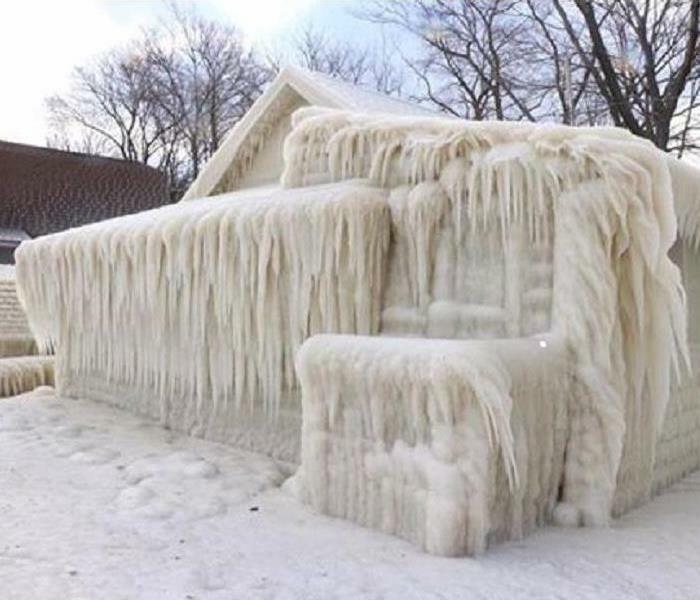 It was mid-winter, very cold, and the water lines froze and burst. The insurance companies that we work with always want to find out the cause of loss in case there is a way to subrogate the loss. SERVPRO of Big Bear/ Lake Arrowhead/ NE Rancho Cucamonga knows that working with your insurance company is primary to getting your home back to where it was before the loss. 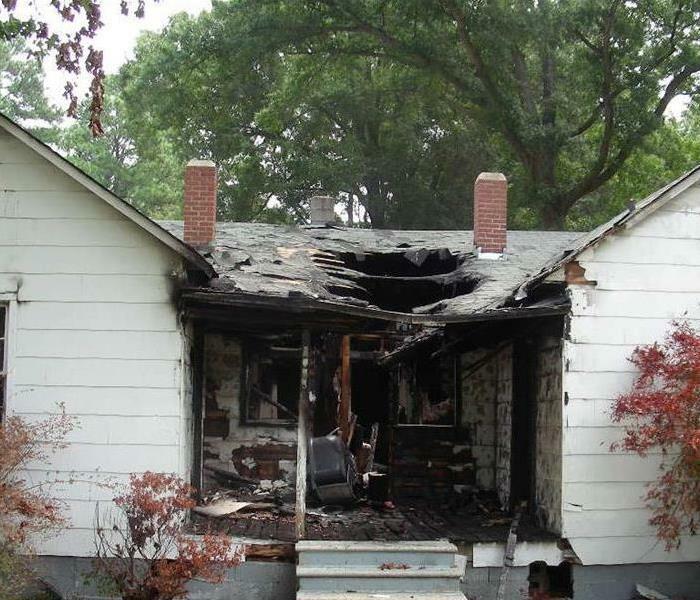 Even a small fire can create smoke damage. Kitchen fires are not a rare thing. Mostly they are caught very quickly and put out by covering the fire with a lid or other item, or by using a fire extinguisher. But there is almost always smoke damage. And the damage is different depending on what was on fire. 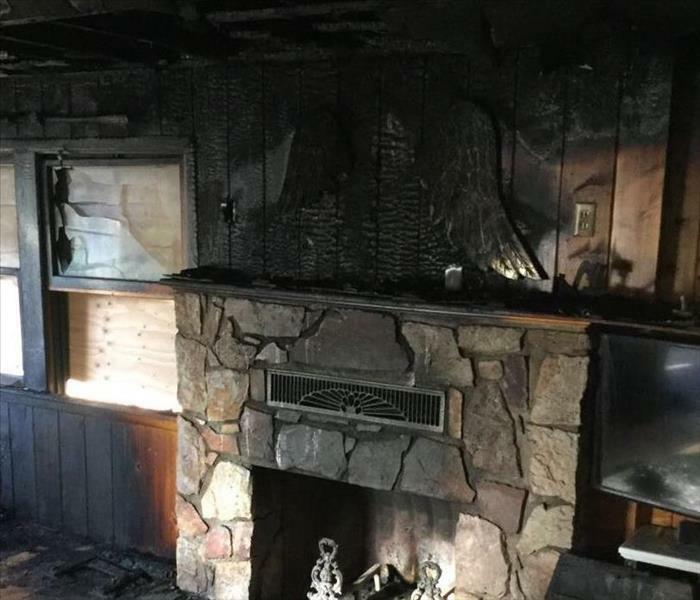 SERVPRO of Big Bear/ Lake Arrowhead/ NE Rancho Cucamonga has been trained extensively in smoke damage clean up and knows just what products to use in each case. 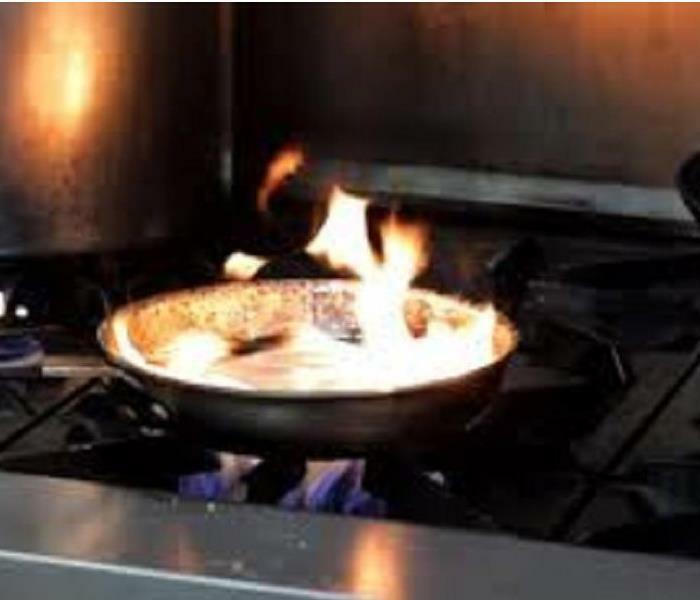 Whether you have had a large or small fire we will be there for you to make your kitchen look like it never happened. 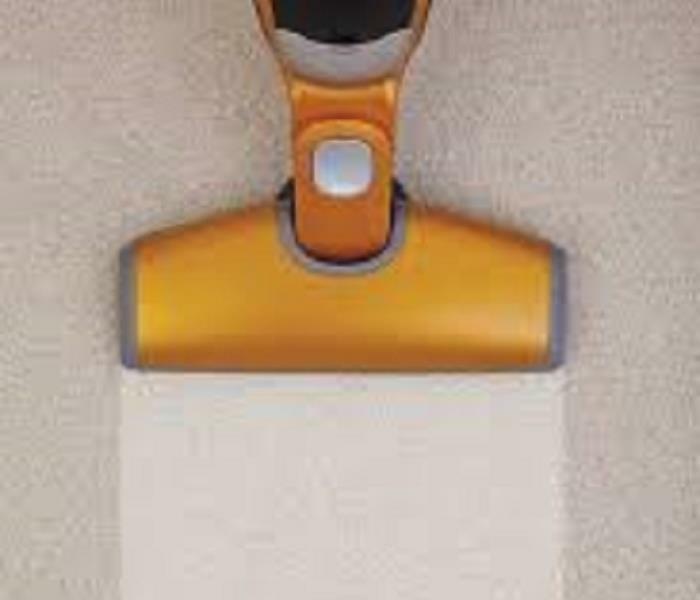 Professional Carpet Cleaning is so worth it! Here are some great reasons to have SERVPRO of Big Bear/ Lake Arrowhead/ NE Rancho Cucamonga come and clean your carpets! 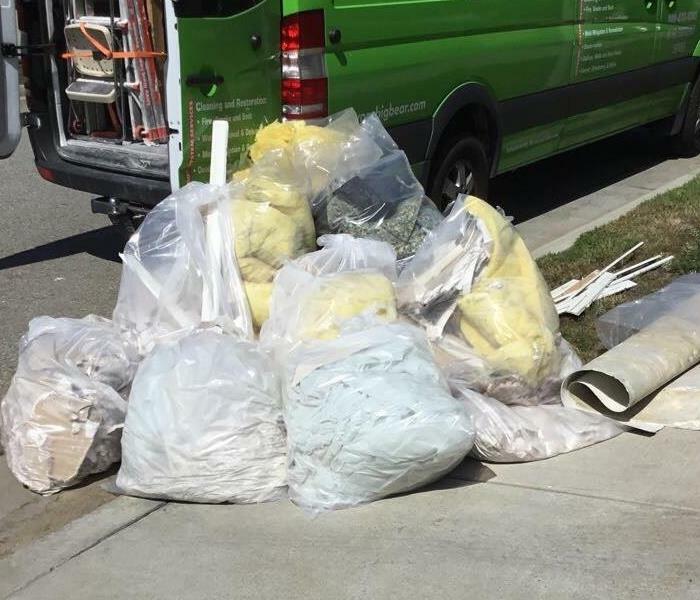 This picture shows pipes in a home on an exterior wall that were not wrapped with insulation. 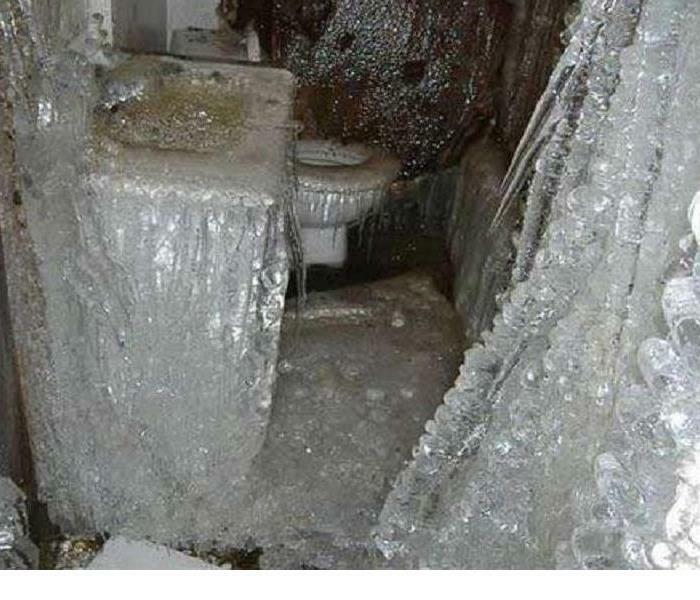 The temperature outside dropped well below freezing and this caused the pipes to rupture. Three stories of the home were flooded! 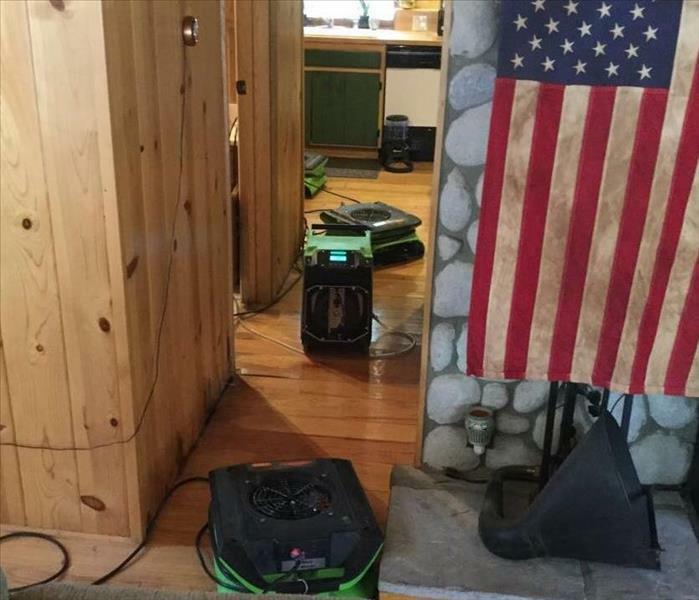 SERVPRO of Big Bear/ Lake Arrowhead/ NE Rancho Cucamonga is here to help when we are needed! But situations like this are heart breaking to us (along with the home owners). 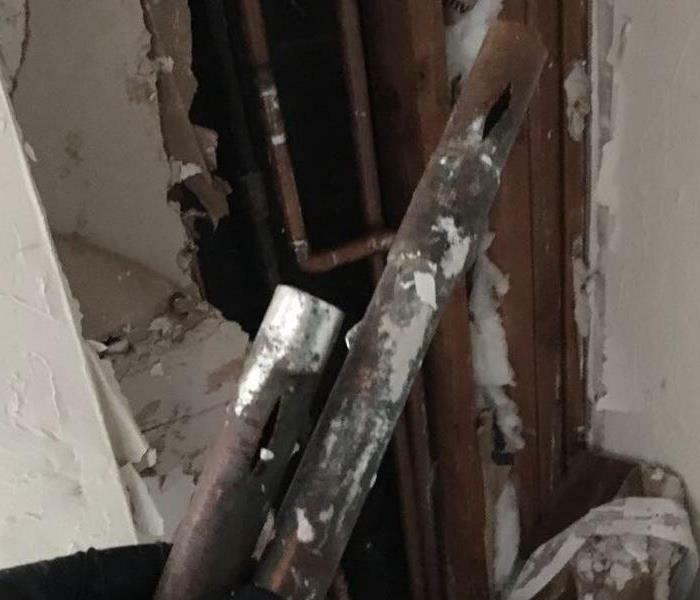 Be sure to have all the pipes in your home's attic and basement area wrapped with insulation so that you might prevent this kind of damage to your home. The Snow Will Be Here Soon! 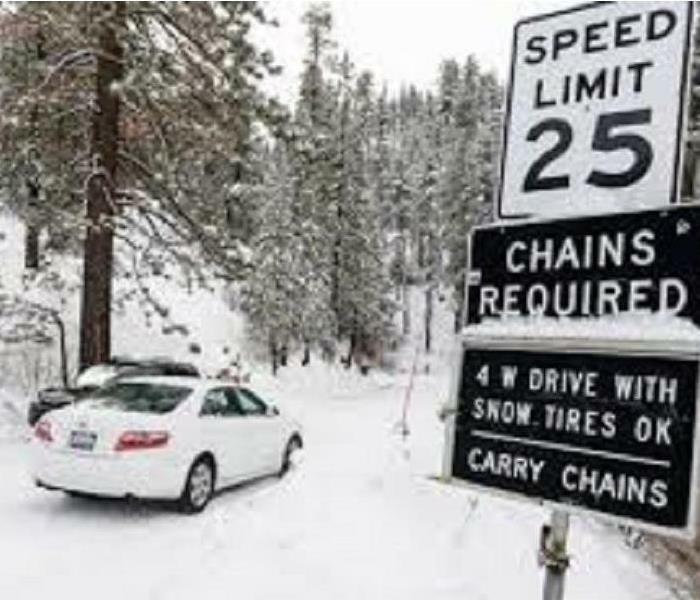 Be sure to BRING CHAINS and be sure to drive slowly! 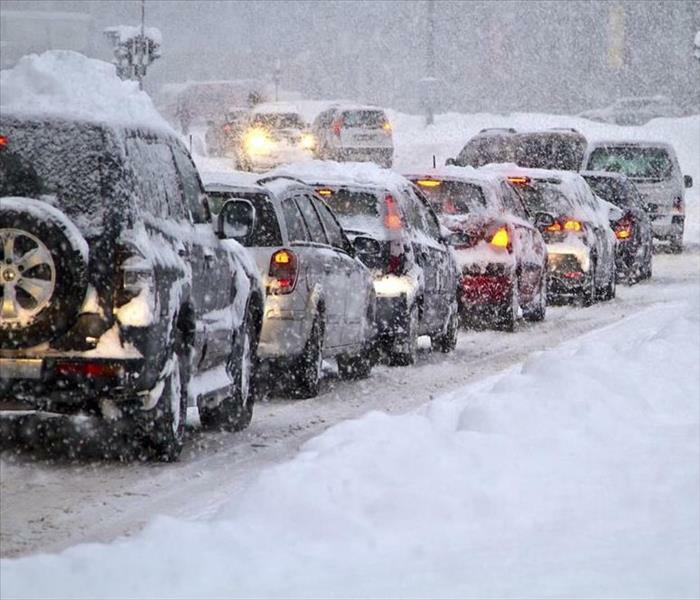 The staff of SERVPRO Big Bear/ Lake Arrowhead/ NE Rancho Cucamonga wants us all to be safe this coming winter. Our staff are trained for driving when there are snowy road conditions and all our vehicles have either 4 wheel drive and/or chains. Should you need our services we will be there as quickly as we can safely get to you and we will take good care of your home when we arrive. We enjoyed a wonderful afternoon visiting with the local children who came "Treat or Treating" down the main street of Crestline on October 17th. The temperature was in the 80's and there were over 500 children with their parents who came for the festivities. 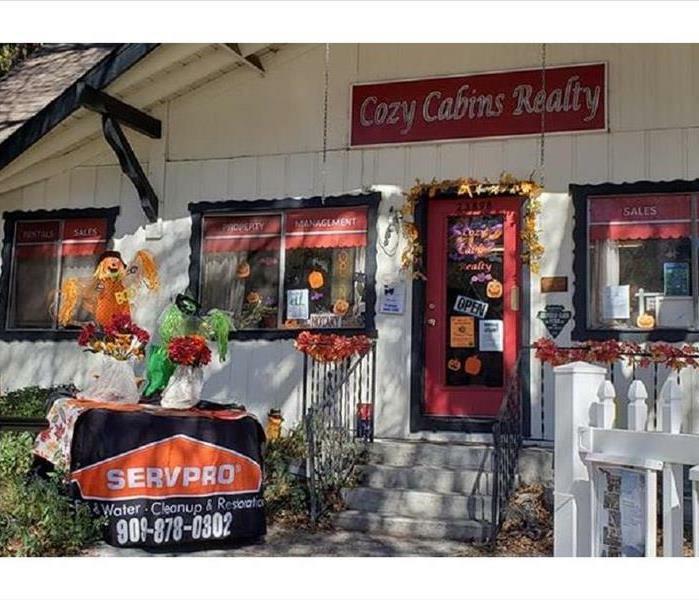 SERVPRO of Big Bear/Lake Arrowhead/NE Rancho Cucamonga loves to participate in the local events on the mountain. It is a great way to let the community members know that we will be there for them if they ever have a need for water damage clean up, smoke damage clean up, sewage cleanup, or mold removal. We are ready whenever you might need us! Here we have a small kithchette in an office building. A pipe in the wall behind the counter burst causing a minor flood. 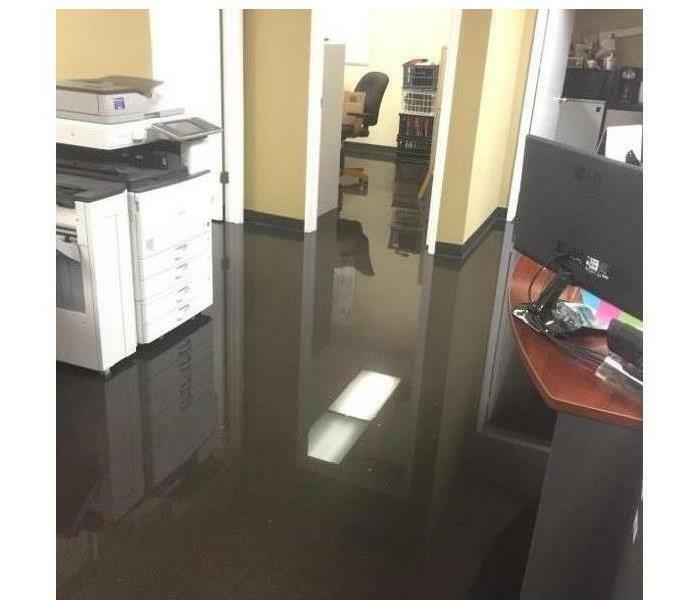 SERVPRO of Big Bear/Lake Arrowhead/NE Rancho Cucamonga was able to come in and clean up the water, dry out the room, and get the staff kitchen back for the employees to use. HIdden behind a cabinet mold had a long life! 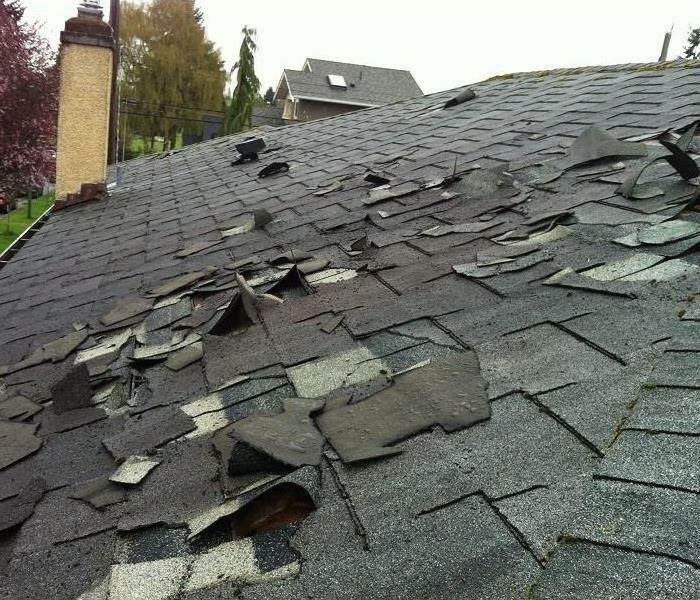 Many times in wind storms roofing tiles can get damaged. It is important to get the roof tarped as soon as possible to prevent further damage. Tarping a tile roof can be tricky. Call SERVPRO of Big Bear/Lake Arrowhead/NE Rancho Cucamonga. We will be there quickly and we know the proper way to take care of this problem. Find where the leak is on the ceiling of the room below. That will lead you to a puddle or soaked insulation in the attic. 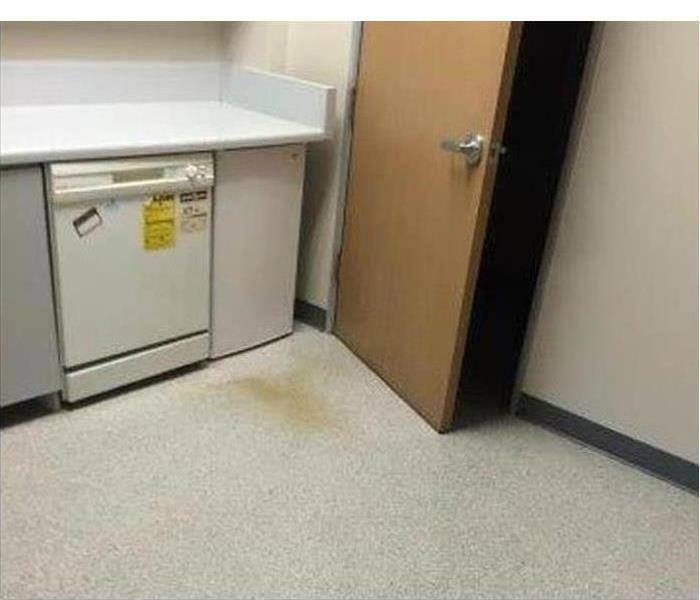 Look for water stains, drip marks, etc. on the rafters above the wet insulation. Trace the water up the rafter. It should point right at the leak in the roof. Check chimneys where they cut through the roof. Mark the area at the highest point where you see the leak start. This is invaluable for whomever has to fix the leak. 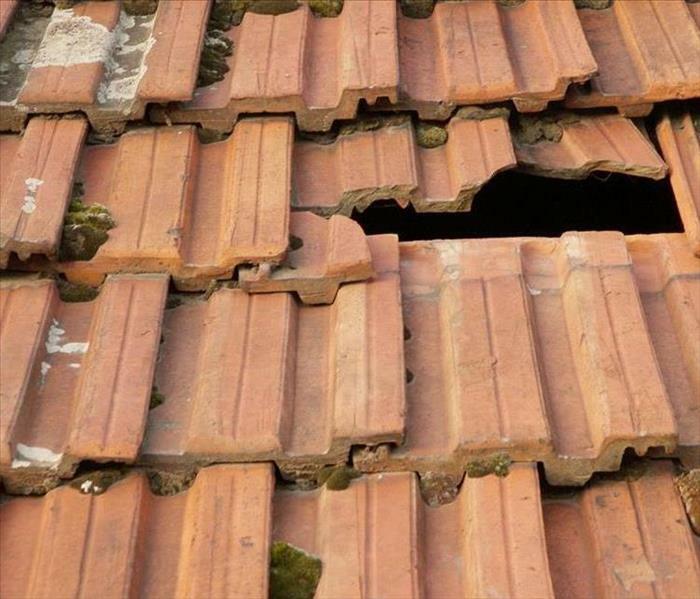 If you do narrow it down to a roof leak, you will need to contact a roofer to fix the leak, and SERVPRO of Big Bear/ Lake Arrowhead/ NE Rancho cucamonga can handle the water damage. 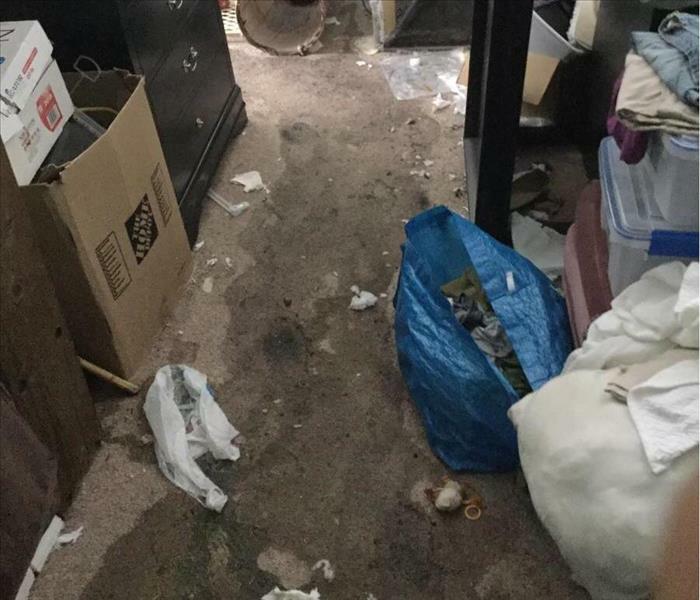 This photos depicts mold found growing under a carpet and pad. 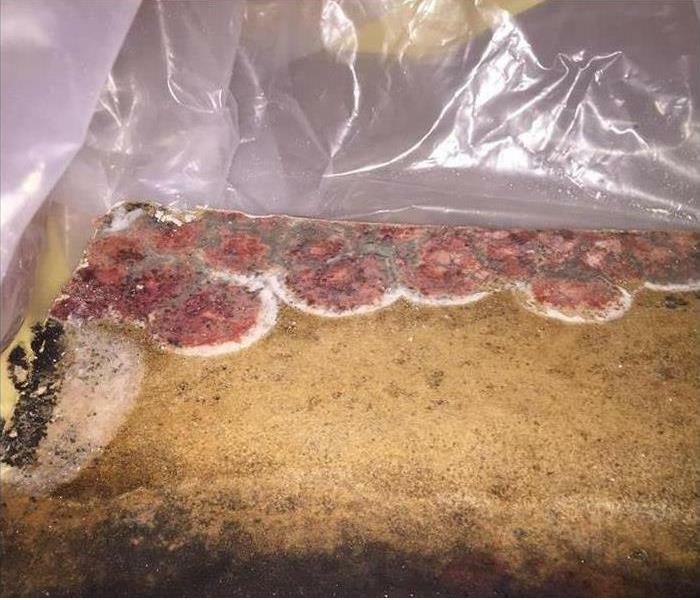 A real estate agent was asked to list this home but when visiting it for the first time found the overwhelming smell of mold. He called SERVPRO and asked that we check it out. This is what we found. The real estate agent then explained to the home owner that the house would sell much more quickly if new carpet and pad were installed after the moldy area was cleaned up. We were hired to do the job and had the clean up done 2 days later. The house sold quickly and we have been assured that we will be called again if that 'smell' was discovered in any other homes the real estate agent was selling or buying. Yes, SERVPRO of Big Bear/ Lake Arrowhead/ NE Rancho Cucamonga can clean up the smoke damage in your home. It does not take much fire to create smoke damage. Sometimes it is just from candles! We recommend that you not try to do the cleanup unless you have products created to do the job. Differnent sources of smoke mean different products to clean them up. This manufactured home sustained significant fire damage when a fire started in their carport from chemicals being stored improperly. SERVPRO of Big Bear/ Lake Arrowhead/ NE Rancho Cucmonga encourages you to store highly volatile chemicals per the label to prevent this kind of heartache. 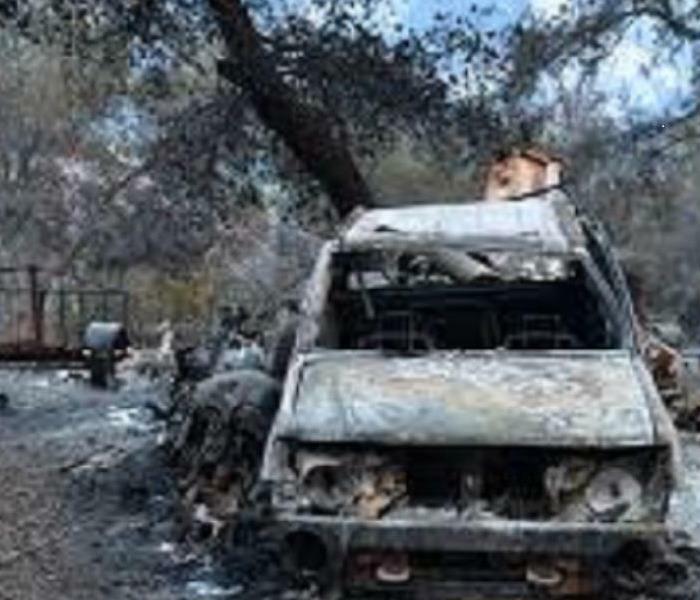 We are required to show the debris that we have removed from a job as way for the insurance adjusters to see that we really did do what we said we did. I think this is a really great requirement and it assures you, the home owner, that you are being served by a very professional company. 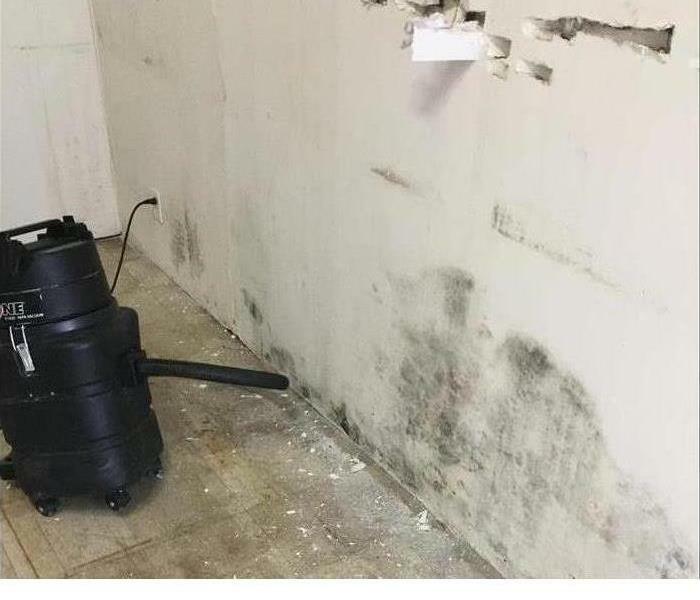 This photo shows Airmovers and a Dehumidifier working to dry a very wet hallway. 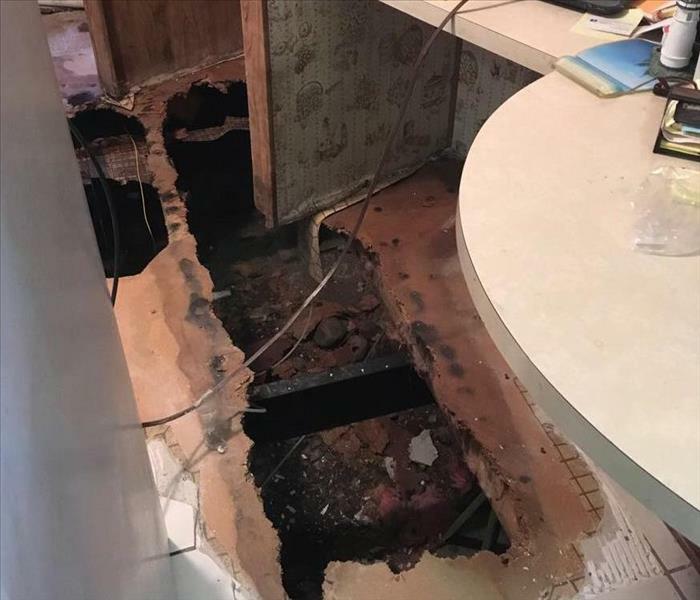 Very typical of many of the situations we are called to remediate, the toilet line broke and sent water all over the bathroom, hallway, kitchen, and living room. We were on site within 30 minutes and began the dry out right away. Mold grows so quickly, especially when the home is a vacation cabin and only visited a couple times a year. Make sure you have turned off your water and opened up the interior doors for better ventilation. This will probably not ever happen in Southern California but we can always be subjected to some ice on our homes here in the mountain communities. Ice on the outside of the house is not too bad, but if it should cause damage from melting and refreezing then there is often trouble. How Sad for This Church. One of the saddest fire claims that we worked on was in a church. The loss was so deep for the staff and the members. They were displaced for several months while the loss was remediated and the facility was rebuilt. It was tough on our crew to see the burnt cross and Bibles. 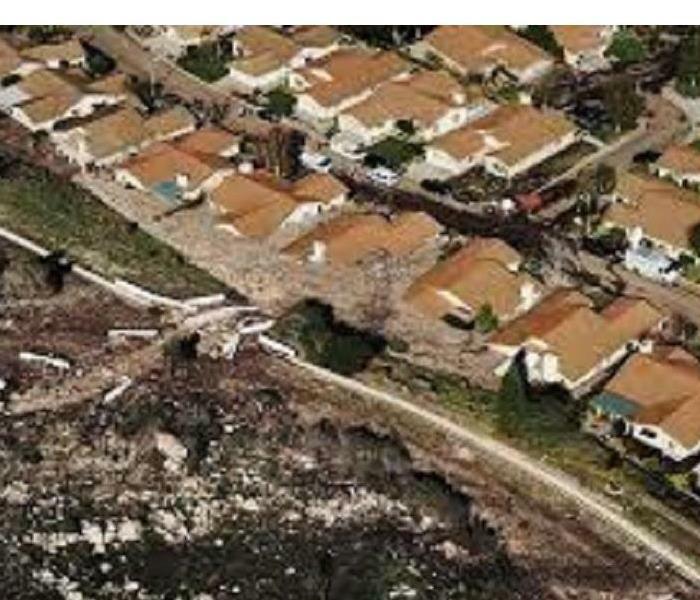 Storms often cause mud flows that can affect your home. Your home might be in the path of this flowing disaster. SERVPRO will be on site within 4 hours to assess the damage to your home and begin the clean up for you. You can depend on us. We will work with your insurance company on your behalf. Fire Storms can be so overwhelming. The loss can be so catastrophic. 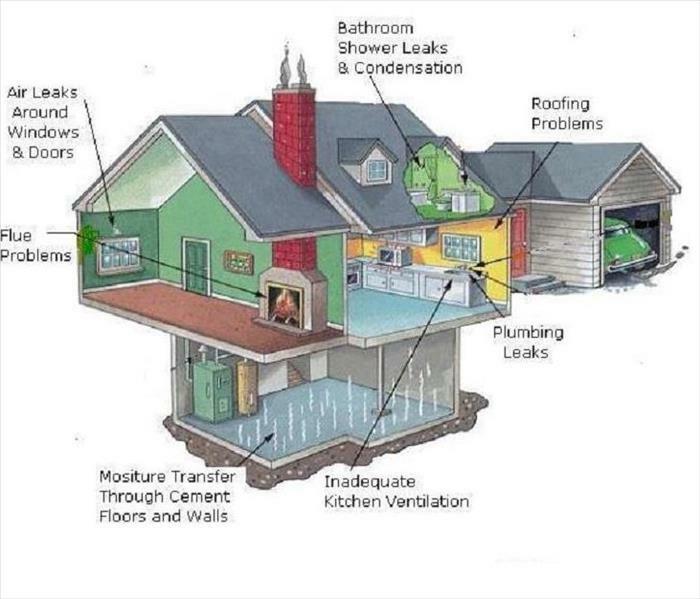 SERVPRO is here to assist you in returning you home to pre-fire condition as quickly as possibe. We work with all the insurance companies to assure you that your needs are our top priority. Wind can be so powerful and scary! 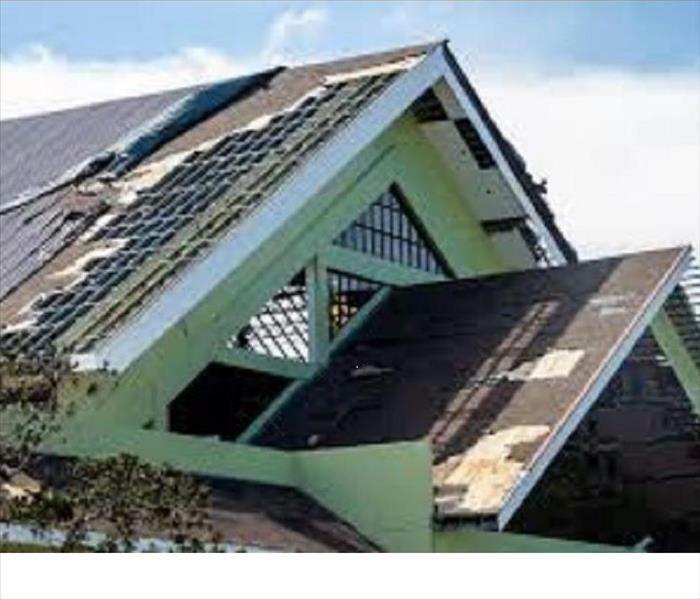 SERVPRO has dealt with many roofs that have been damaged by wind. We know the best way to tarp the roof with weights and boards to assure that no more damage will occur in your home until the roof can be repaired. Call Us. Mold grows when water sits. 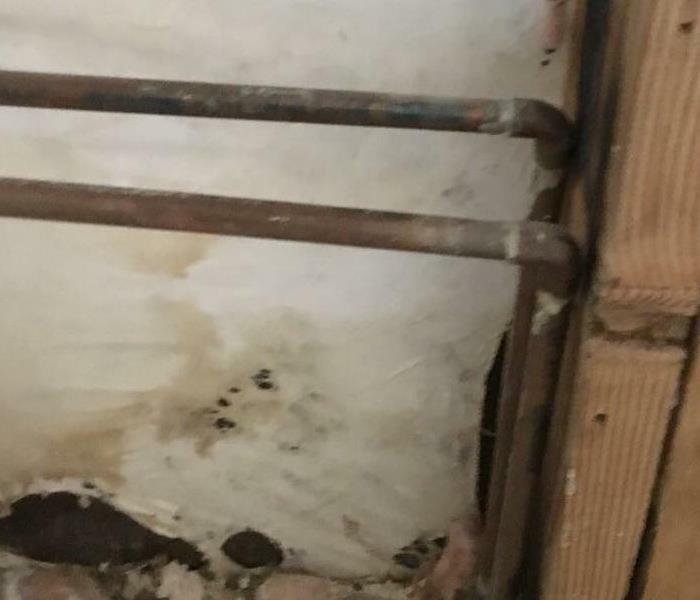 Is this case the water remediation was not requested for way too long and when the floor boards were lifted we discovered a serious mold situation. When this occurs the job demolition has to stop until a containment system is set up and the crew put on Personal Protection Equipment. Here is how SERVPRO drys a wall when tile or other wall covering is better left in place. Holes are drilled into the wall and hoses are placed in the holes and then attached to an Air Mover. 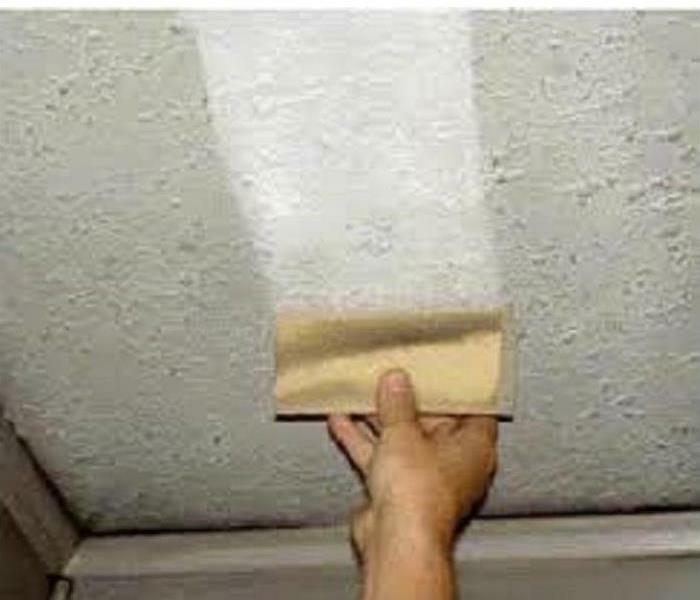 The drywall is tested everyday to see how the drying is progressing. 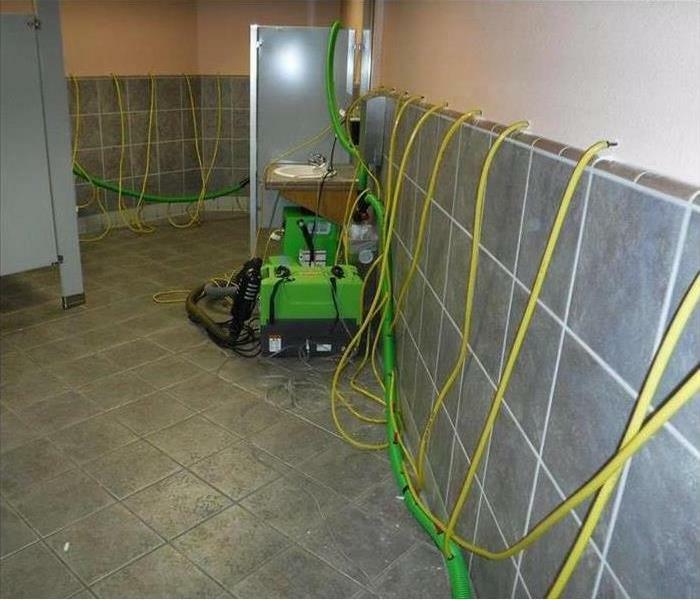 It is a high priority for SERVPRO to respond as fast as possible to a loss in an office building. There are often many people displaced when this happens: employees, owners, and customers. Our goal is to dry up the water quickly and efficiently to get things back to normal. Is there mold in your attic? 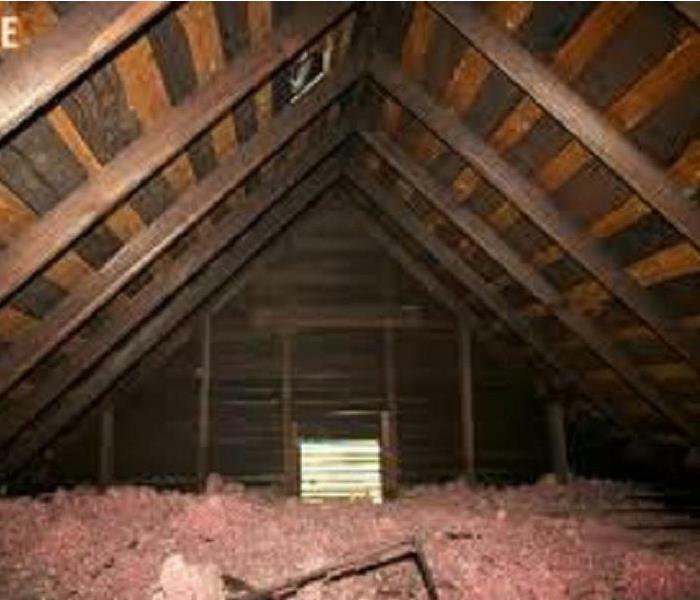 Does your attic smell musty? Do you see signs of mold in the places where pieces of wood meet? Are you wanting to work in the area? Are you wanting to change this area into a room? *Improper venting from pipes and/or vents. Are all possible reasons there might be bacterial growth in your attic. 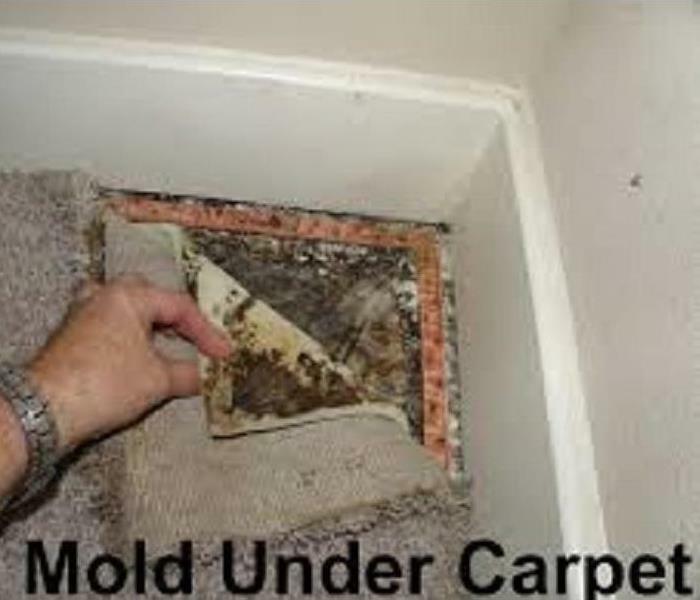 If you want to spend time there and are not sure if it is free of bacterial contaminates please call a reputable mold testing company and have it tested. Then call us if your tests are positive and we will rid your attic of the problem. Oops - forgot to close the door tightly! This poor lady! She was using her walk in tub for a lovely bath but because she did not pull the access door completely tight it leaked while she was bathing. Her bath ended up costing over $2500 to clean up. Walk in tubs are becoming very popular. Be sure you whole family understands exactly how to close the door. If there is an accident and you have water where it should not be please call us ASAP so that the loss can be lessened by quick remediation. If you do end up with a fire in your home do not try cleaning up the soot or smoke yourself. It takes special solvents to get them off any surface. Call us, we can handle this for you. Over night flooding but open in the morning! 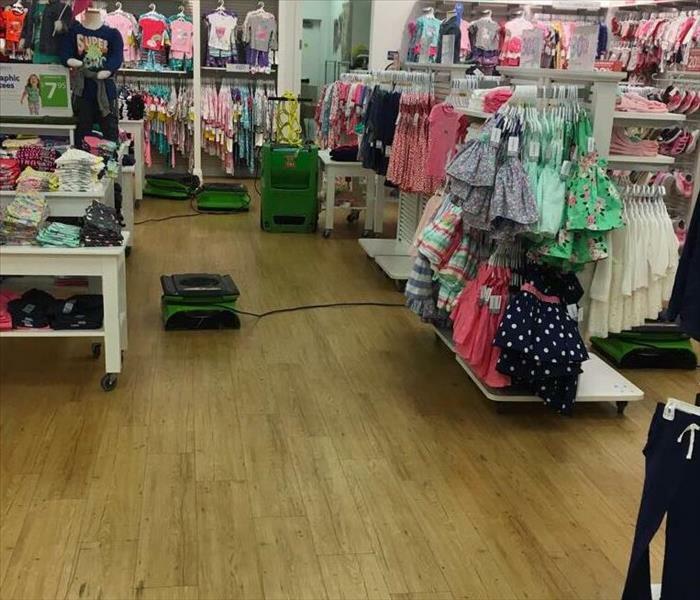 This children's clothing store had a water loss caused by a leaking drinking fountain that ran for hours. They called us at about 10 PM. Even though it was late at night we assembled our staff and filled our vans with about 40 pieces of drying equipment...air movers and dehumidifiers. We set them all up and quickly put them to work. Thanks to our availability 24/7 the store was able to open their doors at 10 the next morning and only a couple of air movers were left to run. Manufactured Homes have special needs when there is a water loss. Here is a loss that was a long time coming. The line for the ice maker was leaking for a long time and caused significant damage. In a manufactured home the sub-floor typically sits on a metal frame and is about 18" or more off the ground. In this situation the water leak ruined two layers of floor (tile and vinyl) and then completely rotted the sub-floor. The ground under this area was also saturated. Remediation included the removal of all the wet materials and the use of air movers and dehumidifiers to dry up the home. No matter where you home is, if you have an ice maker check it regularly for leaking. Here is a quick little chart that shows places where you might have mold in your home. Most often we find it under kitchen and bathroom sinks, behind and under refrigerators, and in damp storage areas under houses. The best tell tale sign is "that musty smell." Call us. We will come out and do a visual inspection of your home and let you know what we see. If you like we can put you in touch with a professional mold testing company who will check air samples and specific locations in your home. We will be very glad to come and remove any mold that might have been found. 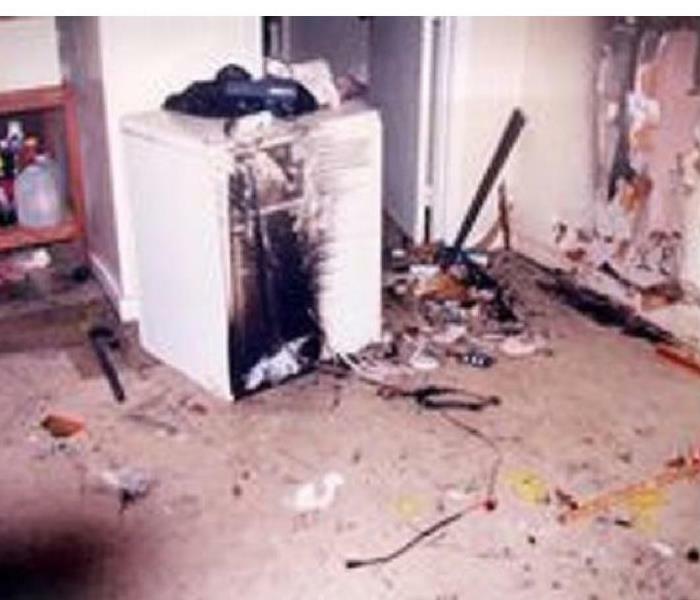 Your Dryer can catch fire! There are lots of things in your house that can cause a fire but it is pretty simple to make sure your dryer is not one of them. Lint is highly flamable. 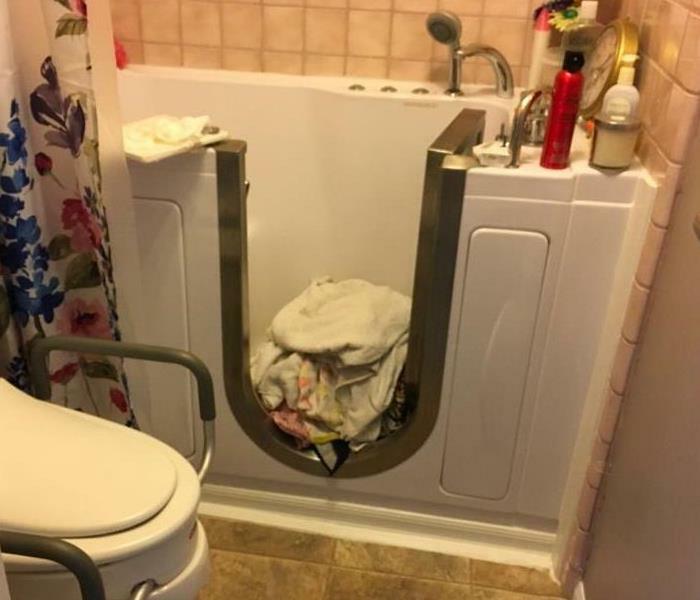 It needs to be removed from the dryer each time you use it. You also need to be sure to clean out the vent tube that takes the hot air out of the house. This can collect lint that might not get caught with the lint filter. 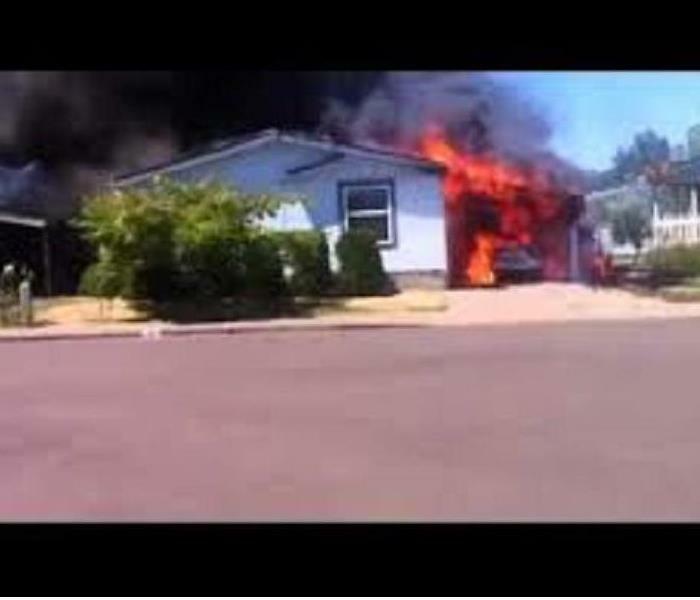 Such simple little chores can save you the major heart ache of a house fire. Chimney Fire that caused a mess. Here is a picture of the outside of the house where there was a chimney fire. Chimneys MUST be inspected regularly for wear, creosote buildup, and cracks. Your nice cozy fire can turn into a disaster if you do not maintain a safe chimney. Have a qualified chimney sweep company inspect your fireplace, stove, insert, and chimney annually. 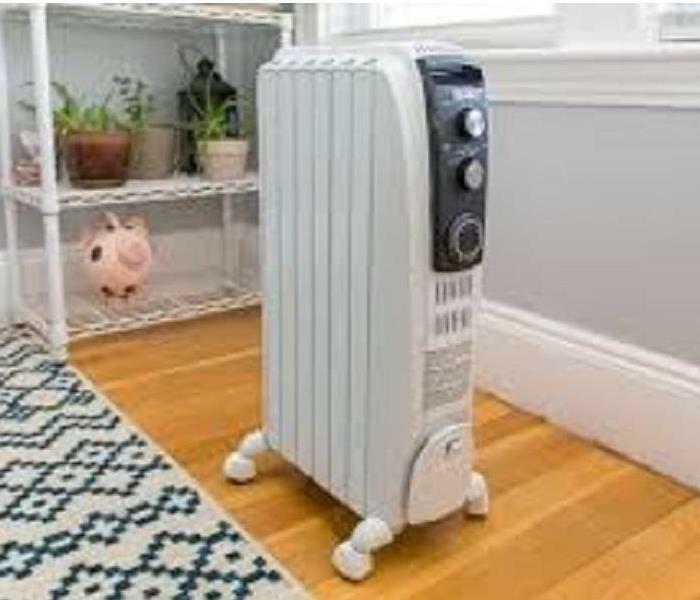 Try to time your appointment so that you did not need to use the fireplace for at least 2 full days. We are always available to clean up smoke residue in your home and to remove fire and smoke damage, too. Yes, especially in the mountains, water can get under your house and cause trouble. 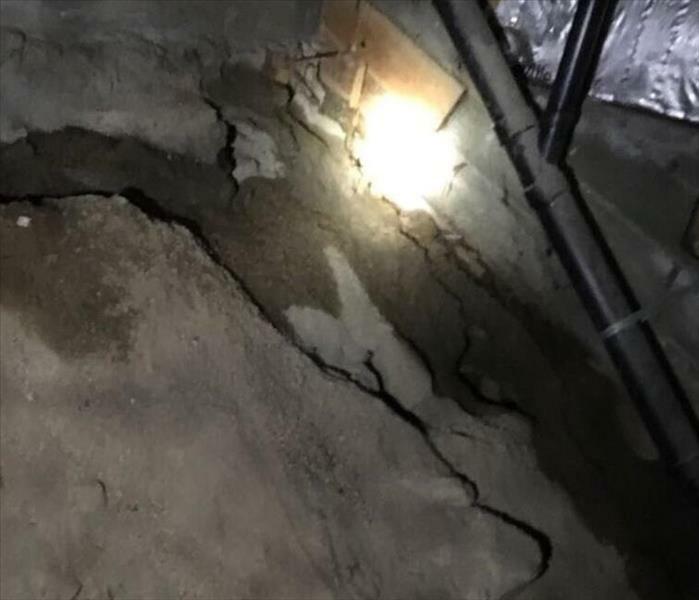 In this case there was a leak in the kitchen and water went down through the floor, but it can and does seep in through cracks in the foundation. SERPVPRO Big Bear can come into your 'build up' area and remove the wet dirt, dry out your floor joints, and sub-floor from underneath. This is very important to keep bacterial growth from developing. 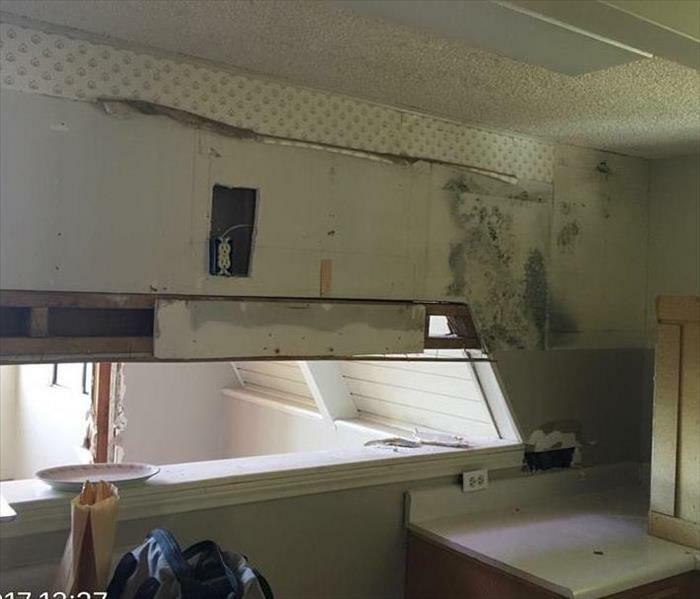 This poor kitchen had mold everywhere that came from a long term roof leak. By the time we finished the remediation of the situation there were no cabinets, no drywall on the walls or ceiling, and there was only sub-floor underfoot. 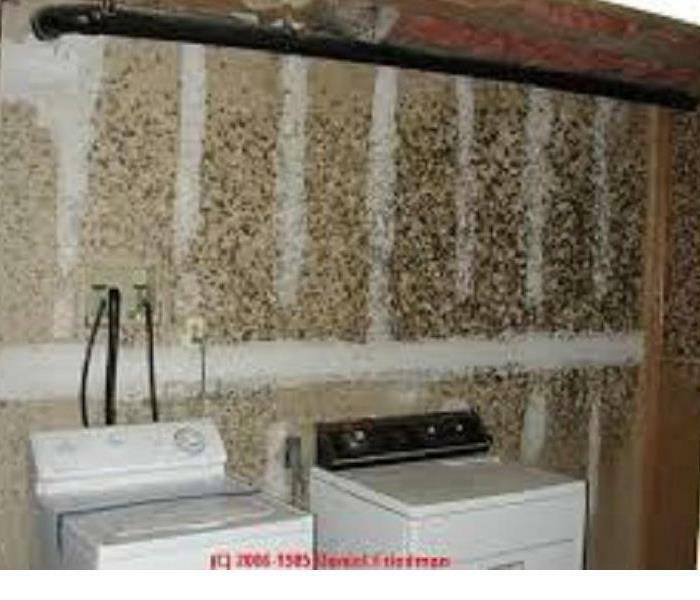 The owners will have to cover a large portion of the remediation because mold is usually limited in the insurance plan. Be sure you purchase insurance with at least some mold coverage. And be sure to "sniff" around your home and do some investigating if you smell anything musty. It can happen...toilets and bathtubs can back up and leave human bio hazard in your home. Not only does this smell poorly, it contaminates the air in the building. We are trained to clean up this type of waste. We have the HazMat clothing, boots, gloves and masks and we have been trained to do the best job. Your local SERVPRO office is available everyday and any hour of the day to take care of you! Here is a really good phone number to keep for yourself or for your guests who might be visiting this winter. 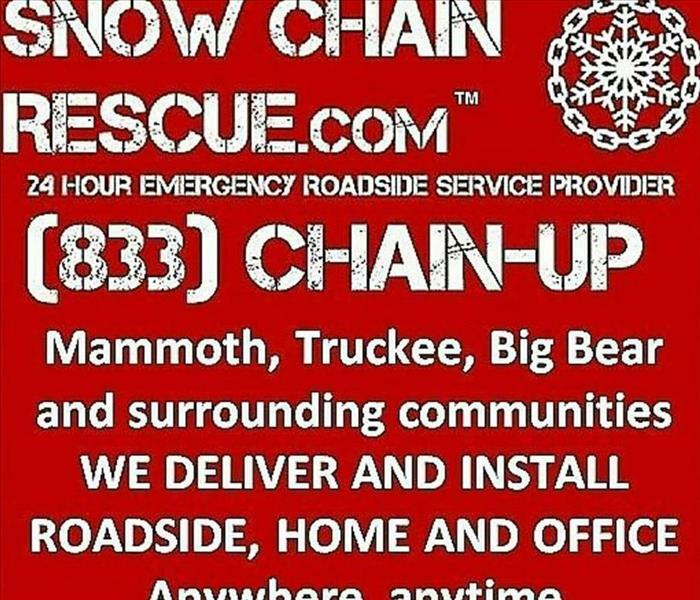 You never know when you will need help chaining up! This was the results of a forgotten candle left burning when the owners left their vacation cabin and headed home. We can clean it up but what a loss for the owners. This is what happens when mountain home owners and renters forget to turn off the water to their homes when they are going to be away! Please remember to shut off water and drain pipes during the winter. The Busy Season Is Almost Here! Our Mountain Communities always enjoy the beautiful winter season! But it means there will be lots more guests on the road! Be careful, be patient, and smile. This is the most beautiful place in Southern California in the winter! The Crew is proud to serve the Big Bear/Lake Arrowhead/NE Rancho Cucamonga communities as well as all the other areas on the mountain. We have four wheel drive vehicles and/or chains and our crews are trained and experienced in driving in snow and ice.